The aristocracy of ancient China supplied their elaborate tombs with food, furniture, clothing, and companions and servants, so that all necessities and pleasures would accompany them in the afterlife. During Shang times (1523–1028 BC), people and animals were killed and interred with their owners in a practice known as immolation. 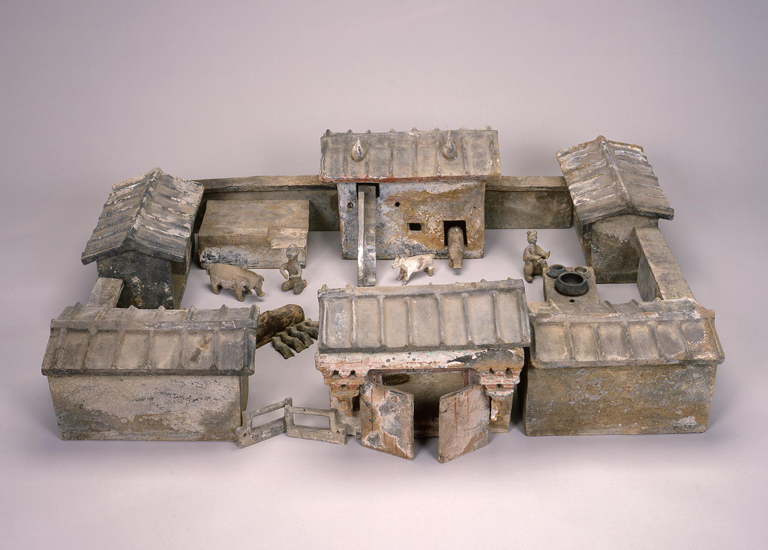 But by the fourth century BC, pottery figures (ming-ch’i) were used instead—a change that led to the production of mortuary ceramics like this Han dynasty Barnyard. The work reflects the period’s interest in the development of agriculture and animal husbandry. Its large size and careful detailing of a sow and five piglets, a goat, dog, rooster, and even a woman cooking on an open stove indicate that it was commissioned by a wealthy family who wished the deceased to be well provisioned. Andera, Margaret, Nonie Gadsden, Britt Salvesen, and Laurie Winters. Collection Guide: Milwaukee Art Museum. Milwaukee, Wisconsin: Milwaukee Art Museum, 2004, p. 66, 74, cat. 112, color illus. p. 66. Milwaukee Art Museum News, January 2004, no page number, color illus.